Albert Bierstadt was born in Solingen, Germany, in 1830. He studied painting in Dusseldorf and Rome (1853-57) before emigrating to America. In 1858 he was employed by F. W. Landers to help him survey an overland wagon route to the West. Bierstadt's role was to paint panoramas of the Rocky Mountains. Paintings such as Rocky Mountains (1863) and the Yosemite Valley (1866) made him one of the most popular artists in the United States. 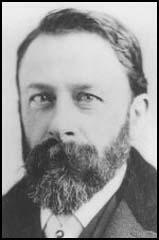 Albert Bierstadt died in 1902.